﻿ Turn The Lights On! It's Coleman Hawkins Birthday! Turn The Lights On! It’s Coleman Hawkins Birthday! On the 21st of November, a new Jazz star was born! Coleman Hawkins was a great American Jazz Musician, that made a new interpretation of the saxophone. On his anniversary, we thought that the perfect tribute was to show you the best of the lighting piece world that was inspired by him! Continue scrolling! Coleman Hawkins was born on the 21st of November, 1904, and he was a true Jazz Star Musician. He is known for being the first saxophonist that actually knew the instrument real value. Miles Davis said that, after hearing Coleman play, he was inspired to play his own music. Unfortunately, jazz lost this star at the 19th of May, 1960, however his deep soul will live forever! DelightFULL – a mid-century lighting brand, inspired by the Jazz Music Industry – was inspired by his work and their design team decided to create a lighting design piece that would resemble and incorporate this musician essence. The final result was this amazing mid-century floor lamp: Coleman Lamp. 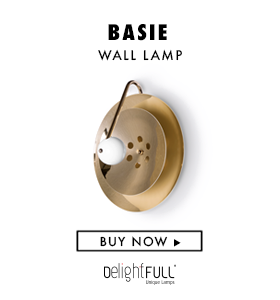 A minimalistic lighting piece that will blend in every style décor room. Coleman is a sophisticated design that will be the perfect choice to display at a Scandinavian Home décor, or even at a mid-century inspired living room, right next to an armchair that seems that it was brought directly from the fifties to the present! Coleman has a singular head shade, that is handmade in aluminum, and you can choose another color! DeligthFULL has 5 different standard colors, however you can choose any of the colors of the RAL color’s website! This shade is movable, so you can adjust the lighting of the room. And speaking about lighting, you can also choose the type of bulb you want, and even the temperature of the lighting! The body of the lamp is in brass, and you can choose another finish, and the base is in aluminum. However, due to the fact that this floor lamp is handmade and customizable, you can also change the type of material. The base can be in marble, and you’ll have the chance to pick between a range of 4 different types of marbles. Let’s turn the lights on and sing Coleman Happy Birthday!